Let’s start out the 2019 Honor Bowl with an intriguing matchup: Notre Dame Sherman Oaks Knights return to The Honor Bowl for the third time. Head Coach Kevin Rooney loves this emotional event for the educational value that permeates for pregame, half time and post-game festivities. Desert Vista, travelling in from Phoenix wanted in to the showcase and their wish was granted! 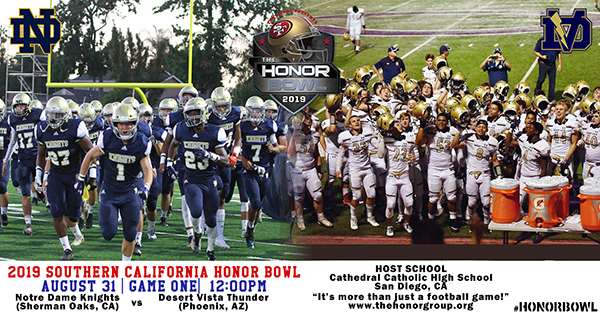 The Thunder’s Head Coach Dan Hinds was not concerned about the matchup – he wanted his team to experience what The Honor Bowl is all about. One of the top teams in Arizona will bring it to compete against a strong CIF Southern Section Knight team. Game Two will be one not to miss! JSerra Lions Head Coach Pat Harlow made room to be in the 2019 Honor Bowl. This will be the first opportunity for the Lions to experience and compete in the Showcase. 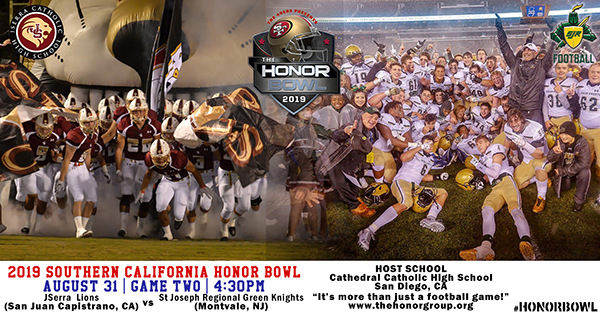 Consistently one of the top teams in California, JSerra will do their best to compete against the #1 team in New Jersey. Head Coach Augie Hoffman’s St. Joseph Regional Green Knights will make their second appearance in The Honor Bowl. It is an honor to have the respect and commitment from schools such as St. Joseph Regional to travel from Montvale, NJ for a football game. In 2016 SJR had a great experience when they had the rare time to visit behind the gates of Camp Pendleton and will be sure to book this once more. Saturday Night Lights – San Diego Style will be the reason to be at Manchester Stadium for another great finale in the Honor Bowl. Cathedral Catholic Don’s will be hungry to continue their successes in 2018 coming short on an apparent upset in the CIF D-1AA state finals. The Dons have experienced participating in many Honor Bowls and understand that when you give, you get back! We salute Head Coach Sean Doyle and his staff for their commitment to have the desire to return year after year! 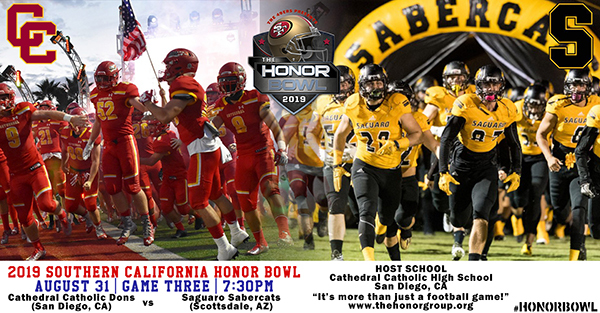 Head Coach Jason Mohns with the Saguaro Sabercats returns for the second time to be in this finale. Saguaro are the reigning 4A Arizona State champions six years in a row and will surely bring their unique style of football and match up athletically against a typically strong Cathedral Catholic football program.